A lot of people call Sao Paulo ugly. Especially when compared to its friend Rio de Janeiro. Rio de Janeiro is a beautiful city filled with beaches, sun and shopping malls where you can spend your hard-earned cash. Every guy wants to visit the Marvelous City when they first think about going to Brazil. Even the 2016 Summer Olympics wants a piece of it. But what if I told you its ugly friend Sao Paulo was more fun? What if I told you beneath the concrete jungle was a hidden playground with everything you could want to explore in a Brazilian city? Don’t make the same mistake as me and avoid Sao Paulo when you first go to Brazil. I made the same mistake with a woman once. I was showing a friend photos of a chick who wanted to talk to me. But there was one problem. She was not attractive. I mean, she was pretty fugly. I didn’t want to talk to her. So my friend and I made a deal. If the ugly girl had a cute friend, we would have a double date and he would hang out with the ugly one. The classic “take one for the team” scenario. The double date happened and guess what? The ugly girl was better. She talked a lot and was interested in knowing my friend. She wasn’t uppity and actually asked him questions. Plus she drunk like a pirate. On my date, the pretty girl acted like she was a super model. She checked her phone like she was a doctor on call waiting for an emergency. She had one word answers to my questions and she didn’t even drink! While I tried to get her to open up and show personality, my friend and the ugly duckling laughed and joked and enjoyed each other’s company. Talking to the pretty girl was like pulling teeth out of Young Jeezy’s mouth. I tried to get passed the physical beauty and see what she was really about. But it was useless. I wasn’t going to crack her on the first date. She was all show. Or more accurately, just a difficult person with nothing interesting to offer me at the moment. And this leads me to another tale of two friends. Many guys thinking about visiting Brazil have a crisis on their hands. Which Brazilian city should you visit? I have the answer to that question and how I came to it. 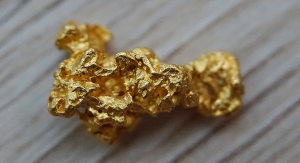 Rio de Janeiro – The Golddigger? When you visit Rio, you have to be on your toes at all times so you don’t miss an event. It’s a slower paced environment where a week can fly by and you still have a feeling of not doing enough. Especially if you are new to Brazil and you stick around the “safe zones”. You have to put in time and energy to get to know the real Rio and not what it wants to show you -the South Zone. It’s hard to fight off the hypnotizing appeal of palm trees and beautiful women in thin string bikinis but it’s all seduction. Walk down Ipanema and if no one asks you to buy their sun glasses or beach towels, I’ll be amazed. Although world-famous and fun- it’s also a well done infomercial wanting you to spend as much money as possible. Sao Paulo on the other hand is an old school brochure made of bulk printing paper: It’s not pretty but it’s filled with what you want. Sao Paulo is the ugly friend worth talking to. Wow, look at that building. The palm trees. The busy, foot traffic. There are many more beautiful shots like this around the city. Listen to Brazilians chatter in Portuguese as they zip through the subway eating biscoitos and sipping hot coffee. Time is money and they have no time to waste! It feels like the city is alive. Can you feel it? Can you find me? That was easy eh. Meet other curious travelers on a FREE walking tour. Traveling solo? You aren’t anymore. Why Should You Go To This Brazilian City? You like to party. Sampa has it all – bars, clubs, dance floors. And they are filled with pretty women too. You want to improve your Portuguese – SP has over 11 million Brazilians in the city to talk to. You LOVE good food. Japanese, Italian, Arab, Lebanese, Brazilian, AMERICAN – SP has it all. You want to see everyday Brazilian life away from the beaches and tourists traps. SP is the land of the hardworking Brazilian. You like interesting attractions like historic landmarks, world-class museums, beautiful parks and cultural centers. You want to visit a REAL melting pot. With 111 different ethnic groups, Sao Paulo is home to the largest Japanese population outside of Japan, the largest Lebanese population and it’s the #1 transplant Brazilian city. Basically – if you want to experience every aspect of a Brazilian city – go to SP. Sao Paulo is a huge Brazilian city. But even in the concrete jungle, Brazilians are still friendly and will help you get around. 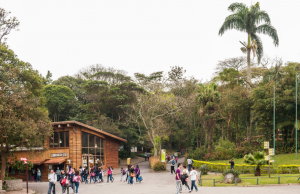 You want to know the best places to visit in Sao Paulo. Knowing everything about SP in one trip is impossible. But you can definitely go to a few interesting places in a week. And if you are really on borrowed time, you can visit the top spots in a three-day roller coaster ride. My first trip to Sao Paulo was three days and that’s it – I fell in love with the crazy city. I didn’t even want to go to my next destination that week- Rio de Janeiro. After my first trip to Sao Paulo, I knew I had to spend more time there. If you just spend three days in Sampa, I guarantee you will fall in love with the place too. There are sketchy areas like other major cities. I will tell you where they are and how to avoid sketchy people. I’ve been out in Sao Paulo until sunrise – alone. I’ve went out to the Old Downtown area for the nightlife many times; an area where Brazilians recommend NOT to go after dark. But we all know locals are afraid of their own shadow half the time. They are jaded by living in their city for years. They’ve seen a lot of bad news on television or they’ve had scary experiences – they can’t imagine how a visitor can enjoy the nightlife for a week without getting hurt. Trust me, you’ll be fine. I’ll give you some safety tips too. You might even have an adventure of a lifetime. I have a guide to lead you during your adventure. Check it out below. If you still choose to visit Rio de Janeiro, I won’t be mad. I love Rio too. Sao Paulo is only six hours away by bus and one hour by airplane. 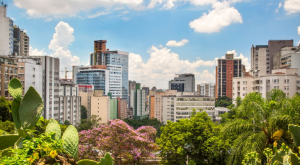 The Man’s Guide To Sao Paulo has a three-day itinerary for travelers with time constraints. Going to Rio is no excuse to not go to Sao Paulo. BUT. If you still can’t make it, be ready when you do decide to go. It’s a trip you have to experience. But you are going right? 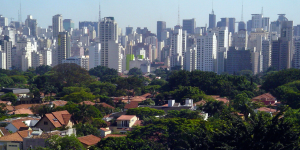 Let’s read why Sao Paulo should be the #1 Brazilian city to visit. Let me tell you what happened to me in Canada. A few years ago, I went to Toronto. I only knew one person in the entire city. I spent three days in Toronto having NO IDEA what to do. I didn’t know where to go, what to eat or what to see. I spent my trip walking around aimlessly and taking a pic on the CN Tower I can’t even find now. Don’t make the same mistake as me. You want to travel to a city where you KNOW you will have a good time. When you go to Brazil – go to the right Brazilian city. Detailed information about popular neighborhoods like Vila Madalena, Liberdade, Pinheiros, etc. Where to party: the best bars and clubs in Sao Paulo. If you’re single, you’ll have a ball. And it’s all going to be FREE. Well some of it. 100% of this content will only be available in my monthly email newsletters – I’ll only show some of it on Rio In A Week. So if you want to see everything, subscribe to the blog. This is an experiment blog series similar to my “How To Start An Online Business & Live In Brazil” five-part series. I’ll gradually post each topic as time progresses. I hope you enjoy the series and it convinces you to visit Sao Paulo. When you get to Brazil, you realize the prettiest women don’t speak a lick of English. Think of the finest women you have met in your city. Did they speak more than one language? They can get what they want out of life without learning another language. Hence, learning Portuguese is the best way to meet and date Brazilian women. Check out my latest books Become The Man Brazilian Women Want and Flirt In Portuguese: Phrasebook For Men. If you don’t know any Portuguese and you want to attract Brazilian women, you need these books.